Yesterday, December 23, 2017, the Bookstore in Kilgore & The Coffee Cherry had its last business day of calendar year 2017. We opened August 19, 2017, so we have completed four months in the wild world of retail. What are some of the things we have learned? For me the main thing has been the joy of engaging customers in the bookstore, sharing ideas and fashioning friendships. On the Coffee Cherry side, I have watched a steady stream of customers come in and "become one" with our lovely barista. We are always thinking of new ways to add value to customers' experience in the store. The BIK book club is hitting its stride with selections in place through May. People are finding the upstairs meeting room and booking it for community events. We will begin a water color class soon, beef up our children's reading hour and expand our book inventory. But all these things we plan have one touchstone: conversation. We want the store to be a place folks can come to fellowship, where they can find a listening ear, where they can laugh, and even sing if they want. Thanks for your support in 2017. We will see you around the corner come January 2, 2018. I've been doing a little light reading. That is if you call catching up on the history of Greek culture in the 6th and 5th Centuries BCE light. What's life without an occasional head nod to Socrates, Plato, Aristotle, Pindar, Thucydides, Herodotus and the crew? Perhaps the most amazing thing about Edith Hamilton's The Greek Way is that the more things change, the more they stay the same. How do you spell "hubris" anyway? Yesterday, my wife Paige celebrated her birthday. Last night after Thai food, we made it home to cut the cookie cake Paige had requested. Our almost four-year-old granddaughter had been longing for a piece of that cake since we furtively picked it up Wednesday. After we sang Happy Birthday, it was time to get down to business. My daughter told the grand baby that she needed to wait her turn, that Ganmaw had first dibs. The little girl looked at the stack of serving plates on the counter, then came out with this zinger: "My plate's on top," she said. I guess she was right because she got the first slice. Well, that's the way it is for all of you at the Bookstore in Kilgore and the Coffee Cherry. Your plate is always on top. Come see us when you get the chance. One of the things we are doing at the bookstore is providing a place where regional authors can showcase their work. When you enter the store, you will find their work prominently displayed. 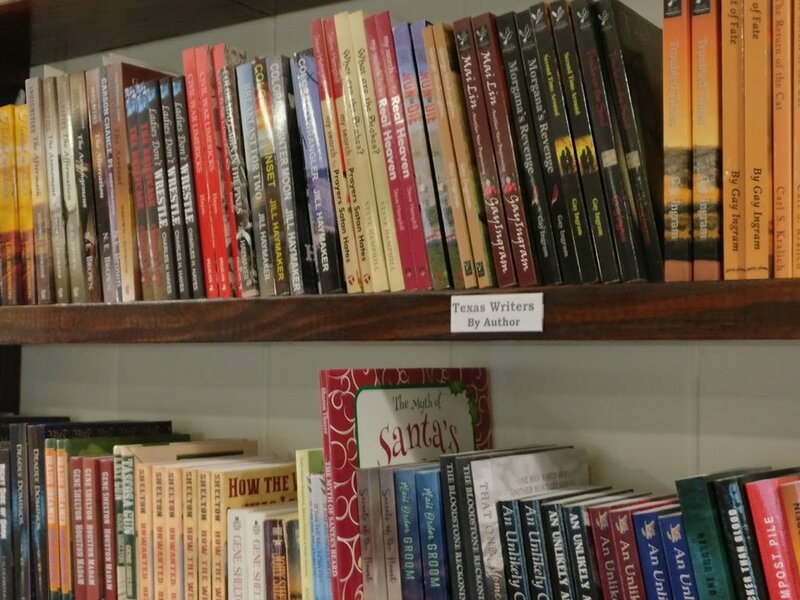 Some of the Texas authors's books currently on display at the Bookstore in Kilgore. It's a crying shame that many of these fine writers are shut out of stores like Barnes& Noble and Books-a-Million. But they have a home here. We will also be hosting author signings so that you can meet, greet and visit with the people who have succumbed to the Siren song of creative writing. Already there has been talk of beginning creative writing courses and critique groups at the bookstore. We would love to hear if such courses or groups are of interest to you.